Many universities, colleges and post-secondary institutions use a Learning Management System (LMS) to facilitate collaboration between teachers and students. More recently, a growing number of higher education institutions are starting to use G Suite for Education’s cloud-based tools to create and share course materials and assignments, allowing teachers to give feedback in real time and students to collaborate with their peers. But until now, there was no easy way to integrate G Suite with most Learning Management Systems. To tackle that problem, last semester, Google piloted Course Kit—a free toolkit that allows instructors to use Google Drive and Google Docs to collect assignments, give feedback to students, and share course materials within any LMS. And last week the company announced that now is making the tool available more widely through a beta program. When students want to turn in assignments using Course Kit, the toolkit will automatically manage permissions so students no longer have to edit access to their submitted files while being graded. Once a student submitted an assignment, the teacher can use Course Kit's grading interface to switch between students and their submitted files, all in one tab. 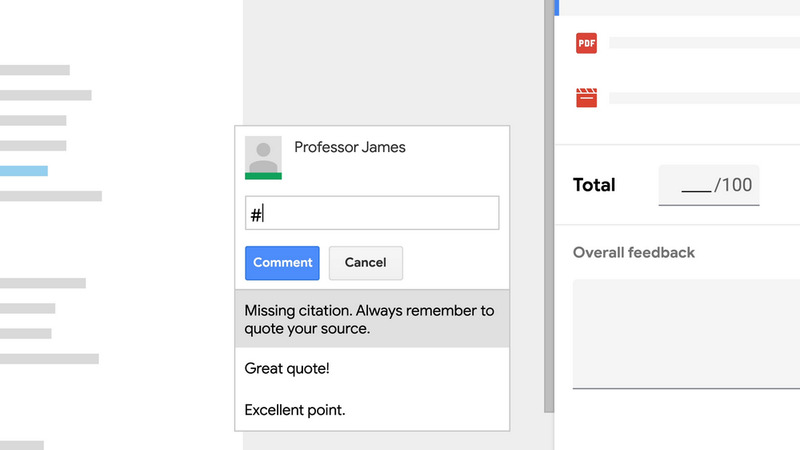 Educators also have the ability to privately give feedback on assignments with the collaboration features of Google Docs and Drive—such as in-line suggestions and margin comments. Course Kit includes a new feature that lets instructors insert commonly used margin comments using a customizable comment bank, allowing teachers to save time while giving personalized feedback. “Educator comments are added to a bank, which can be easily reused over and over, or edited to make feedback more personal. Our professors found that very useful,” said Ben Hommerding, Instructional Technologist at St. Norbert College, one of the institutions that were part of the pilot program. When the teacher is finished reviewing assignments, grades and feedback are synced to the LMS and files are returned to students. “This saves a lot of time managing grades manually,” said Hommerding. Students get notified when their assignment is returned and can view the instructor’s feedback directly in their LMS. Teachers can also add course materials from Google Drive directly into the LMS using Course Kit's file embed tool making it easy to share materials. Moreover, Course Kit also creates an archival copy of every returned assignment so professors have an easy-to-access record of submissions. Course Kit is available in 44 languages. If your institution uses G Suite for Education it can request access to the beta version. Once requested, your IT administrator can install Course Kit in your LMS. Course Kit it's easy to set up and works with all LMSs that support LTI (Learning Tools Interoperability (LTI) standard). For more information about Course Kit, visit Google’s blog.